Pantone 18-3838 Ultra Violet, the colour of the night sky and mystery, will be 2018’s trendiest colour. 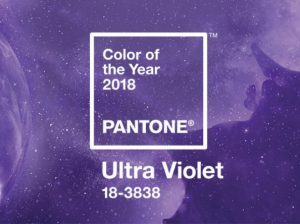 Pantone 18-3838 Ultra Violet, a decidedly challenging yet thoughtful shade of purple that communicates originality, ingenuity and visionary thinking, is Pantone’s Colour of the Year. Complex and contemplative, Ultra Violet suggests the mysteries of the cosmos and the intrigue of the discoveries that lie ahead. The vast and limitless night sky is the symbol of what is possible, and continues to inspire the craving of a world beyond our own. If you would like to know what’s trending this year, Pantone 18-3838 Ultra Violet is the answer.